Ceder Wright and Alex Honnold are basically explorers for a living — the two travel together to crazy places around the world and record their journeys for National Geographic. On a recent trip through the American Southwest, they picked up an unexpected addition. The two men had stopped somewhere in the desert for a bathroom break when they spotted a tiny, shivering puppy curled up in an old tire. They couldn't just leave him there, so they picked him up and took him in. Of course, they weren't prepared for raising a puppy on their trip, so they fed him string cheese and let him drink their water. The duo named him Sufferpup ... after the name of their grueling expedition through the desert, Sufferfest. He quickly became the unofficial mascot of their trip, trotting along after the men everywhere they went. After the expedition was over, Sufferpup was adopted by an awesome family in Colorado. But Wright and Honnold still go back to visit their little adventure buddy — even though he's a LOT bigger now. 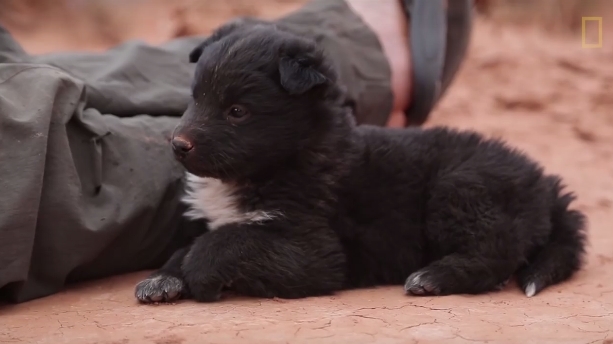 Responses to "Hikers Stumble Upon Abandoned Puppy, Decide To Keep Him "
Awe , that puppy is way to cute . You have great souls to help that baby . I know I would never have been able to leave it behind . What a terrific thing you two did. He's adorable. I'm also glad you were able to find him a forever home. you guys are awesome!! .... good job!! To whoever abandoned this baby in the desert, expect a visit from Karma....What a mean spirited thing to do!...Thank you so much to the compassionate Human beings who helped this pup. Reminds me of how Merle was found as in Merle's Door the book. This pup will be famous one day. You guys rock! what kind of '' person '' does that? you guys are great! Thank you for saving Sufferpup and finding him a forever home. You two are special!! Special guys renew my respect for humans. Thank you for saving this sweet pup. Awesome. Well done - lovely short film! What on earth is 'string' cheese. We have not heard of this kind of cheese in France.